Fast food has really stepped up its game in the last decade, serving lighter, leaner options that are more nutritious than their standard deep-fried and highly processed counterparts (although still pretty processed). "Food companies are constantly trying to keep up with their increasingly health-minded customers because they don't want to miss out on sales," says Frances Largeman-Roth, registered dietitian nutritionist, nutrition expert and author of "Eating in Color." "That's why we're seeing plenty of quinoa and other whole grains available, as well as more customization, like the ability to choose your own sauces and dressings and small and large versions of items so that customers can control the portion size." This not only makes things easier for health-minded people but also those with dietary restrictions, whether it's gluten- or dairy-free or plant-based eaters. "Long gone are the days of having only a choice of medium or large on your fries — now many places offer small side salads, fresh fruit, baked fries, baked potato (make sure you don't drown it) and small cups of broth-based soups," says Roger E. Adams, Ph.D., Houston-based dietitian, nutritionist and founder of eatrightfitness.com. "The number one tip is to know the menu going in, so you aren't tempted when you smell those fries and other wonderfully smelling temptations." Having a plan is a great start, but actually choosing those healthy gems on the menu is key. 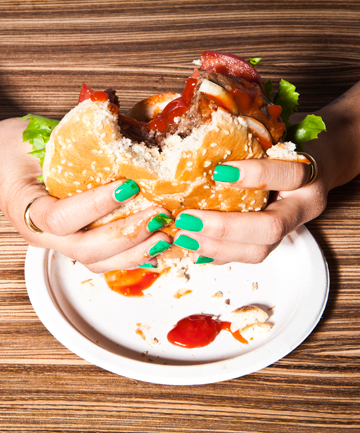 Here, registered dietitians and nutritionists share the healthy fast food options they order when they're in a pinch.